Neighbors rushed to the rescue of a 10-year-old boy and a 19-year-old man who were inside an East Hartford home when fire broke out overnight. 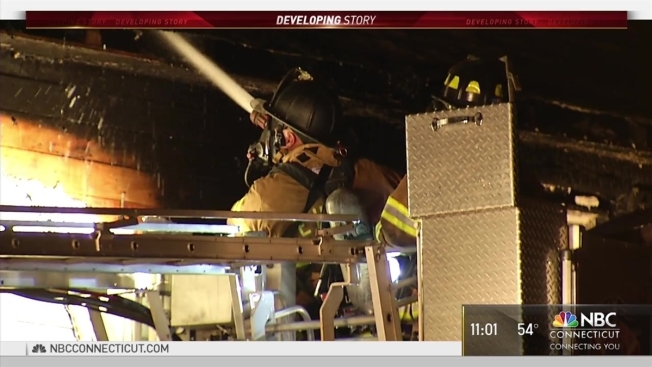 Fire officials said flames broke out at 64/66 Saunders Street shortly after midnight Tuesday. Before firefighters arrived on scene, two neighbors helped pull the 10-year-old and 19-year-old from a window. Susan Campbell was one of those neighbors and described the moment she pushed up a window and helped both the victims escape. “He screamed and cried. I said 'Come here,' and I pulled him out and then I said there was another person in the room saying. 'I can’t see anything, I can’t see anything.' So I reached in there. I couldn’t quite reach him. I put my body in and I couldn’t breathe. so I pulled myself out. And I still had my cell phone, I said, 'Look at the light, look at the light, reach for my hand, reach for my hand.' And he reached far enough that I could grab his hand and pull him to the window,” she said. Campbell and another neighbor were able to lift the teen out of the home. Both victims were taken to the hospital to be treated for smoke inhalation and are expected to recover. A firefighter was also taken to the hospital for heat exhaustion, fire officials said. That firefighter was in stable condition as of 5 a.m. Tuesday. Fire officials said there were heavy flames on the second and third floors of the multi-family home when firefighters arrived. Firefighters struck a second alarm and it took about an hour and a half to get the fire under control. An uncle of the two young men was also in the home at the time, but was able to self-evacuate. Officials were trying to reach the victims’ mother, who they believe was at work at the time. Two families are currently displaced and the cause of the fire is under investigation. Campbell said she’s just glad she was in the right place at the right time. “I’m just really, really grateful that we heard it and that I was able to get the kids out, and the windows weren’t locked and that I was able to help them because it could have gone the other way with only a few more minutes. It was really, it was coming out the one window by the time we even saw it,” she said.